23 July 2010, Lethbridge, Alberts, Canada: A CF-18 fighter jet crashed during an an airshow practice flight at the Lethbridge County airport in Alberta, Canada, and the pilot was able to eject shortly before the crash. The pilot, Capt. 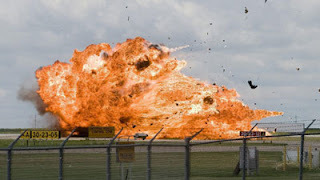 Brian Bews of the Canadian Forces was practicing Alberta International AirShow when the aircraft apparently began to lose control close to the ground. The ejection sequence began about 30 meters (roughly 100 feet) off the ground. After ejecting, the pilot was dragged some distance on the ground before coming to rest. His was taken to a local hospital with unspecified non-life threatening injuries. 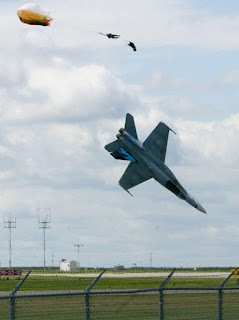 According the the Canadian Department of National Defence, the pilot, who is originally from Eatonia, Saskatoon, has logged more than 1,400 flight hours since his military career began in 1999, with about 1,200 of those hours in the CF-18 Hornet. He earned a private pilot's license in 1995.